Neat offers an innovative Smart Organization System that businesses can use to organize receipts and other documents, manage expenses, and work more efficiently. Learn more about how small businesses use Neat to save time and tackle their biggest organizational challenges. Brenda Humble began working at RDS Plumbing in January 2015 when the business was hitting its third birthday. Brenda accepted the job as a part-time position and was immediately greeted by a bookkeeping system that was less than satisfactory in its organization and efficiency. Upon arrival, Brenda’s first task was to figure out how to leverage affordable technological solutions that would organize the office, streamline documents, and make the most of her part-time availability. Owner Richard “Don” Sponsler recommended that Brenda purchase a Neat scanner and use the Neat hardware and software ecosystem to scan, store, and manage the company’s paper assets. After receiving the NeatConnect, Brenda got to work and scanned more than 2,500 documents from the prior year. To organize the documents, Brenda created three main folders within the Neat Smart Organization System: contracts, documents, and receipts. Brenda then broke those folders into subfolders that included work orders, expenses, vendors, estimates, warranties, and wages. 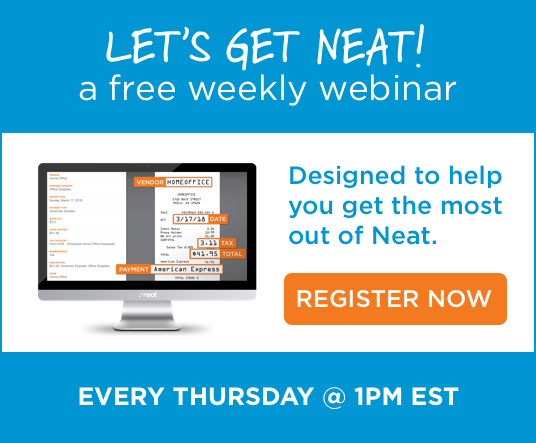 Neat’s customizable folders and subfolders provide a personalized, unique document management system that works for her daily workflow and helps to better manage the business. Beyond document management and storage, Brenda also uses the Neat system to keep an eye on expenses and accounting information. Brenda looks forward to exploring all of the capabilities of Neat’s Smart Organization System to ensure that she’s providing the most valuable service to RDS Plumbing. For now, Neat has given Brenda the confidence to create, implement, and maintain an automated bookkeeping workflow, allowing her to save time and work smarter. Devon and Allison Allen launched Allen Rustic Wood Designs, a small construction business specializing in custom wood arbors, pergolas, interior and exterior beams, and custom woodwork, in 2004. Devon brought 37 years of carpentry experience to their husband-and-wife-owned business, while Allison brought her managerial experience from managing a medical facility and leading a major paper-to-digital document project. Together, the team has tackled custom design projects that span from DJ booths and facades, to custom pieces for a local waterpark. Due to their exceptional craftsmanship and customer service, most of Allen Rustic Wood Designs’ clients are returning customers or referrals. The Allens strive to treat every customer with respect and ensure their top quality projects meet and exceed expectations – and this is what keeps their business thriving. An important aspect of Allen Wood Designs is the backend operations and workflows that ultimately fuel the business. Their attention to detail – both on the design and operational sides – has been a catalyst for their success. From the beginning, the Allens knew that by ensuring there was an organized process, they could preserve the quality of their products, avoid mishandled documents, and manage costs more effectively. To implement and ensure this organization, Allison Allen turned to Neat. Allison continues to use her NeatDesk and the Neat Premium service to scan and organize both business and personal documents. Allison scans and stores invoices, estimates, business expense receipts, tax records, project drawings, permits, bank statements, tool handbooks, warranties, and business cards. On the personal side, she scans and stores receipts, health records, pet records, and utility bills. Allison estimates that Neat’s Smart Organization System saves Allen Rustic Wood Designs approximately 30 hours a month. Aside from generating spending, budget and expense reports, Allison saves time by taking advantage of Neat’s ability to automate Allen Rustic Woods’ accounting workflow. With Allison scanning all of her and Devon’s business and personal documents into their Smart Organization System, she feels confident that all data vital to Allen Rustic Wood Designs and her family is safely secured and easily accessible on any computer, tablet, or mobile device. This diligent organization allows them to get to what matters and focus on pleasing their clients and delivering the exceptional quality their customers expect and appreciate. Freemasonry is a fraternal organization with a rich history dating back hundreds of years. This includes the United States where the first lodge was formed in the early 1700’s with many of the founding fathers also members of the fraternity. Throughout its history, Freemasonry has maintained focused on making good men better by maintaining a high moral standard among its members while also lending support to the local communities encouraging members to be charitable with their time and not just their check books. Sean M. Teaford is the Secretary at Cassia Mount Horeb Lodge #273 in Ardmore, Pennsylvania, which has served as a pillar in the community since its founding in 1853. As secretary, Sean has the daunting task of organizing all of the lodge’s paperwork, paying bills, and managing cash flow. Through his experience, Sean notes that masonic lodges are generally heavily paper-based organizations with a constant stream of paper receipts that are continually piling up. Although he enjoys his work, he strives to be as productive and efficient as possible. And because of that, he knew that there had to be a better way to get things done rather than sifting through piles of receipts, invoices, and other paperwork every time he needed to retrieve specific documentation and share with leadership – so he turned to Neat. Sean already knew that digitizing was the way to go and once he got his hands on a Neat Connect, he instantly began scanning and organizing. Since he implemented Neat into his workflow, he has been very satisfied with how this office tool has positively impacted the organization of his lodge and his overall productivity. Currently, Sean and his team are also working toward improvements in other aspects of the business such as bookkeeping. As they continue to transform a mainly traditional business into the digital world, they are seeking other technology tools and cloud-based services such as QuickBooks Online. “In the future, we plan on implementing a program such as QuickBooks so we will be able to leverage Neat and then export our data into QuickBooks. So for us, Neat it is not just about record keeping, but it’s enabling us to launch an entire financial overhaul,” explained Sean. As Freemasonry continues forging into the digital space, Neat will continue to help the lodge stay organized and boost productivity – helping them keep their financial reporting more streamlined. We're passionate about our customers. Check out why they chose us.